Digging into an interesting decision about the duty to defend an insurance claim turns out to be a long tale about a zombie mark, with strategic moves in prosecution, before the TTAB, and in federal court. It’s still going, but as far as I can tell all that should be left to decide is damages. The facts below are taken from a number of different documents, all linked at the bottom. And by the way, the newcomer wins. 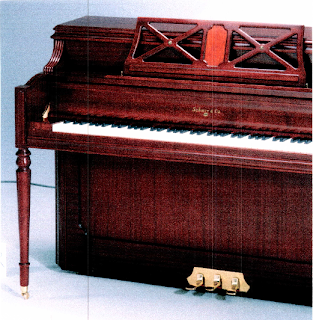 The mark is SOHMER for pianos. The oldest registration is from 1912 with a first use date of 1872. The mark was assigned to Mason & Hamlin Co. and purchased in a Chapter 11 sale by a predecessor to Burgett, Inc. in 1996, along with some other marks for pianos. According to the district court complaint by plaintiff Persis International, Inc., Burgett never used the marks between 1996 and 2003. 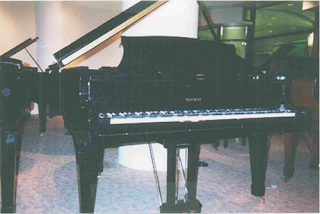 In 2000, Edward Richards, the sole shareholder of Persis, approached Burgett about purchasing a different piano trademark. Burgett instead offered the SOHMER trademark. Richards investigated and learned that the mark was not in use and registrations not renewed. He told Burgett that he thought the mark was abandoned. Richards then filed his own intent-to-use application for the SOHMER mark (the ‘248 application, later assigned to Persis) on February 15, 2001 and eight days later Burgett also filed an intent-to-use application for the mark (the ‘968 application). The duel begins. The prosecution histories for the applications tell part of the story. As one would expect, the Burgett application was stayed pending final disposition of the first-filed Richards application. But note that SOHMER is a surname; both applications were refused registration on that basis. Richards filed an Amendment to Allege Use claiming first use in interstate commerce at least as early as June, 2001 and amended his application to one for registration on the Supplemental Register. 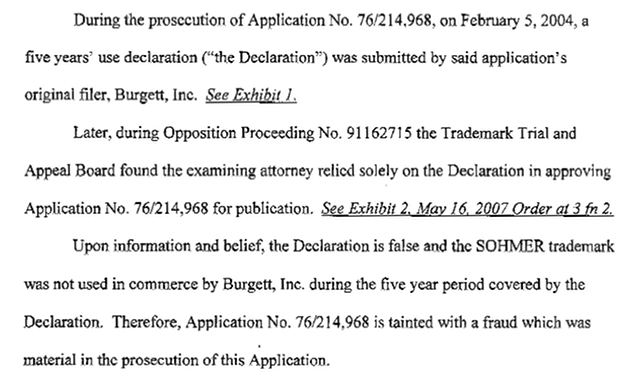 In 2004, Burgett filed an affidavit in its trademark application claiming acquired distinctiveness based on five years of continuous use, which was accepted by the examining attorney. Sharply, Burgett noted that Richard’s amendment to the Supplemental Register made Richard’s priority date June, 2001 (its date of first use), which was after Burgett’s filing date (and priority date) of February 23, 2001. The Burgett application was therefore allowed. Which, of course, Persis opposed. Also in 2004, Persis sent cease and desist letters to Samick and Burgett, claiming senior rights to the trademark. 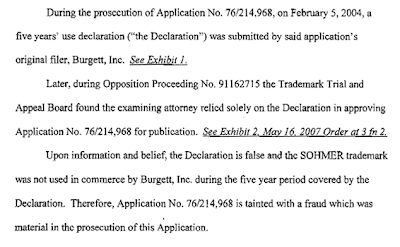 In 2009, Burgett assigned its trademark application to Samick, Samick sued Persis for trademark infringement, and Persis countersued Samick and Burgett. By now, in 2010, Persis had used the SOHMER mark for more than five years, so it filed an affidavit to that effect and withdrew its amendment to the Supplemental Register, which was accepted. The ‘248 application registered on September 7, 2010 on the Principal Register. But the federal court litigation is ongoing, with more parties and countersuits than I care to figure out. At the time of the alleged misrepresentations, Persis contends that Plaintiff “was fully aware that Persis was using the SOHMER trademark in commerce.” The Court concludes that these allegations, taken as a whole, create potential liability and thus, potential coverage for disparagement of Persis’ product—the alleged ownership of the SOHMER trademark. More from Rebecca Tushnet on the duty to defend. Persis International, Inc. v. Burgett, Inc., Opp. No. 91162715 (TTAB May 16, 2007). Persis International, Inc. v. Burgett, Inc., No. 09 C 7451 (N.D. Ill. Sept. 19, 2011). Burgett, Inc. v. American Zurich Ins. Co., No. 2:11-cv-01554-MCD-JFM (Nov. 23, 2011).